Absolutely exquisite! 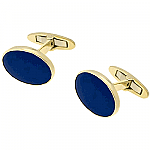 We craft these cufflinks in gold plated silver for a famous Italian retailer...we offer them in solid 18K gold to our customers! Handcrafted to the last detail, with inlaid AAA Grade Lapis Lazuli (also available in Obsidian).